Did you miss Circle of Blue’s reporting on how cleaning up the power sector – namely coal – and reducing energy demand would clear the air and provide water benefits? Not to worry; Brett Walton gives an update on the current smog situation and how a recent report may provide solutions. 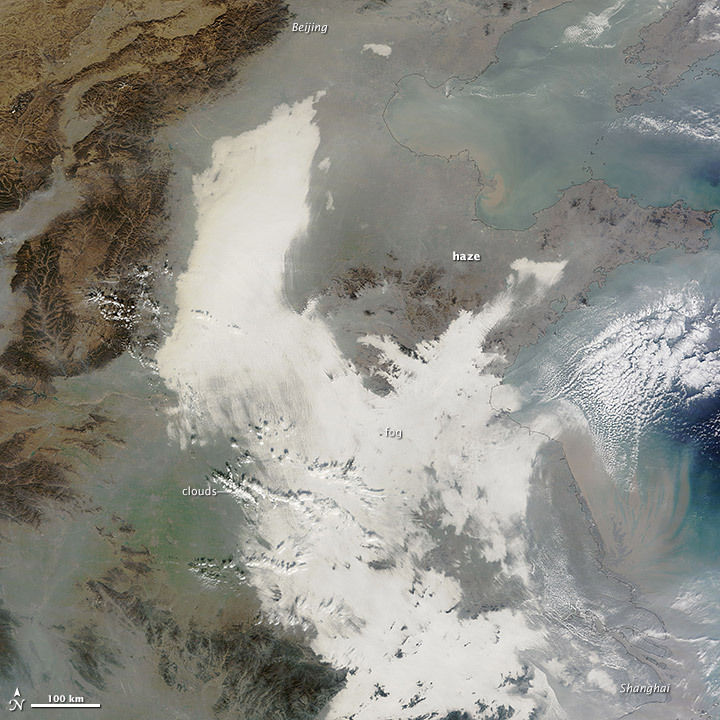 Smog, colored gray, covers eastern China in this image, taken December 7 by NASA’s Terra satellite. One of China’s premier federal science centers is developing a plan to reduce the country’s reliance on coal, the fuel that is both causing the smog and stressing diminishing water reserves. Click image to enlarge. As often happens in the winter these days, air pollution in China reached hazardous levels last weekend. So much, in fact, that it can be seen from space. Poor air circulation during the winter months can set the atmospheric stage for a coal-fired nightmare. For reference, coal accounts for 70 percent of the China’s energy consumption and – along with tailpipe emissions from trucks and cars – much of the nation’s air pollution problems. Starting on Saturday, December 7, and spreading across the eastern half of the world’s most populous country, a dismal airborne pudding reached from Chengdu in the interior to Beijing and Shanghai, the capitals of politics and commerce. The air is still chock full of dust, pollutants, and the tiny particles that are generally referred to as PM2.5 – those that can penetrate deep into the lungs and cause the most severe health problems. According to the air-monitoring system attached to the U.S. Embassy, PM2.5 levels peaked in Beijing at 480 micrograms per cubic meter of air the night of December 7. Meanwhile, the 24-hour average for PM2.5 on December 7 was 348 micrograms per cubic meter, a hazardous level, particularly for children and the elderly. The air that day in Shanghai was even worse, topping 600. Cliff Mass, a professor of atmospheric sciences at the University of Washington, pointed out on his blog that this number is more than three times higher than the average air quality at airport smoking lounges, according to a Centers for Disease Control and Prevention study. China’s hunger for coal is directly related to its thirst for water to mine, wash, and process that coal. According to Circle of Blue’s Choke Point: China reporting back in 2010, coal accounts for roughly 20 percent of China’s total water use. Thus, reducing energy demand would have a double effect: a decrease in the emission of harmful pollutants that clog up the air and a reduction in the water that is used in a rapidly drying country. In a report that was produced earlier this year for the Asian Development Bank, Circle of Blue — with the help of the Wilson Center’s China Environment Forum and various Chinese government agencies — found that incorporating water into a “co-control” management strategy for the energy sector would provide these water and air benefits. China’s Policy Research Center for Environment and Economy (PRCEE), a unit of the Ministry of Environmental Protection, is carrying out a pilot co-control project in Urumqi, a city in the western desert that faces water shortages. “The stakes in choosing a sound water supply strategy for supplying China with electricity could not be higher. The choices that China makes in the near term to define the power sector of the 21st century will reflect a profound reckoning with economic and environmental conditions, which are expected to grow more turbulent unless the world’s biggest nation reins in its energy demand. The proof of urgency is in the air. Do you live, work, or travel in China? I’d love to hear from you. Send me a tweet to @waltonwater or contact Brett Walton directly, or comment below.